Leonardo da Vinci’s achievements continue to amaze us, even after 500 years: iconic images like the Mona Lisa, The Last Supper, and the Vitruvian Man; a remarkable range of artistic and scientific drawings; and inventions far ahead of their time. His notebooks go beyond the writings of other artists of his era, in recording his observations on the world of nature and man. His intense curiosity about “how things work” led to ground-breaking creations: from studies of plants and mountains, to comparisons of the motion of hair and water, to renderings of the human form, based on dissections. His innate abilities were shaped by his unusual early self-education, followed by his fortunate apprenticeship to Verrocchio, the most accomplished painter and sculptor in Florence. Leonardo worked for a variety of patrons, each affecting his work by supporting different sides of his talent. 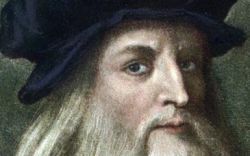 Join Humanities West in exploring Leonardo’s vast achievement and his interaction with the world that shaped him. With support from the Stanford Department of History and the Center for Medieval and Early Modern Studies; the Stanford Humanities Center; the Italian Cultural Institute; the UC Berkeley Institute of European Studies; and the Leonardo da Vinci Society.